The Musial Award for Extraordinary Character is one of two special honors bestowed at the Musial Awards. It recognizes an individual or team who demonstrates remarkable poise, perseverance and overall sportsmanship, and whose approach and accomplishments reflect the character attributes Stan the Man embodied. In 2013, the inaugural Musial Award for Extraordinary Character was presented to the St. Louis Cardinals. The team was recognized for adhering to “The Cardinal Way” and living up to the standards Musial set in a season dedicated to his honor following his passing in January 2013. This year, we’re thrilled to recognize the incredible poise, composure, maturity and class Mo’ne Davis displayed as she became the first girl to earn a win at the Little League World Series. We’re proud to honor Mo’ne as the 2014 recipient of the Musial Award for Extraordinary Character. 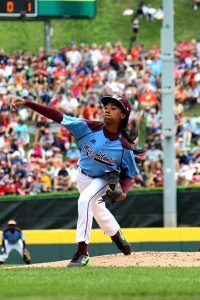 “She’s a great ballplayer but an even better kid,” said one fan to Mo’ne Davis’ family during the 2014 Little League World Series (LLWS). Using her baseball skills as a qualifier, this must mean that Mo’ne Davis is an extraordinary young person. All signs point to the affirmative given her performance and poise during youth baseball’s showcase event. She embodies the class, dignity, generosity, excellence, civility and integrity synonymous with Stan the Man – making her a worthy recipient of this year’s Musial Award for Extraordinary Character. A variety of nicknames, verbs and euphemisms of praise are showered upon pitchers when they are performing at their best. Most were used to describe Mo’ne Davis. She was “dealing” against Tennessee – throwing a complete game, two-hit shutout and striking out eight. The 13-year-old “flamethrower” from Philadelphia registered a 70 mph fastball from 46 feet away. The major league equivalent is over 90 mph. Her performance against Tennessee thrust Mo’ne into the national spotlight. 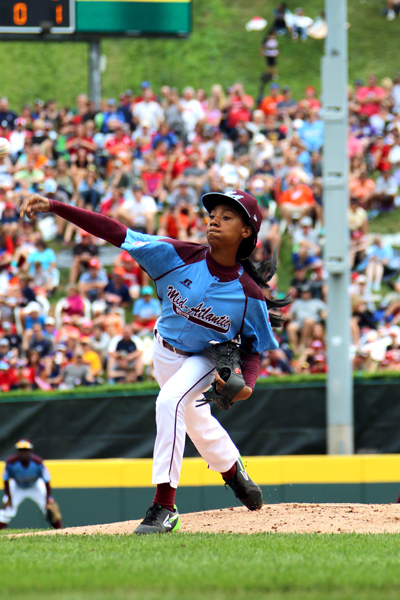 She became the first female pitcher to win a Little League World Series game. The spectacular fashion in which she won that game will be forever immortalized as her jersey will be displayed inside the National Baseball Hall of Fame in Cooperstown, N.Y. However, it’s the spectacular way she handled herself in the spotlight that would make Stan proud. National and international media surrounded her at every turn. She was featured on the cover of Sports Illustrated and received congratulatory messages from sports celebrities such as Kevin Durant of the NBA and Mike Trout from MLB. Mo’ne used herself as a mirror of sorts. Instead of absorbing all of the praise being heaped on her, she reflected it in her teammates’ direction. “I mean, if it wasn’t for my team, we wouldn’t really be here right now,” Mo’ne said as her team advanced in the LLWS. “It’s not just about me…like I can’t fill all nine positions or bat all nine times. So, you have to see the whole reason why we’re here is because we work well together and we work as a team.” Mo’ne’s Pennsylvania team made it to the Little League World Series and she made sure everyone knew it wasn’t all about her. At age 13, Mo’ne Davis knows the value of teammates. She understands the impact she is having on society and her peers. Stan Musial knew the power baseball has – the power to make people rise to their feet and watch in amazement. He also knew, as does Mo’ne, that when people do rise and watch, the player should display class, character and good sportsmanship.